Tomatoes are the most popular vegetable in South Texas gardens, but tomatoes are also one of the most difficult vegetables to grow. The intense heat of our summers, and the relentless Gulf winds, are great challenges to the gardener. Tomatoes can withstand a lot of heat during the day, 100 degree temperatures or higher. But it is the nighttime soil temperature that matters. 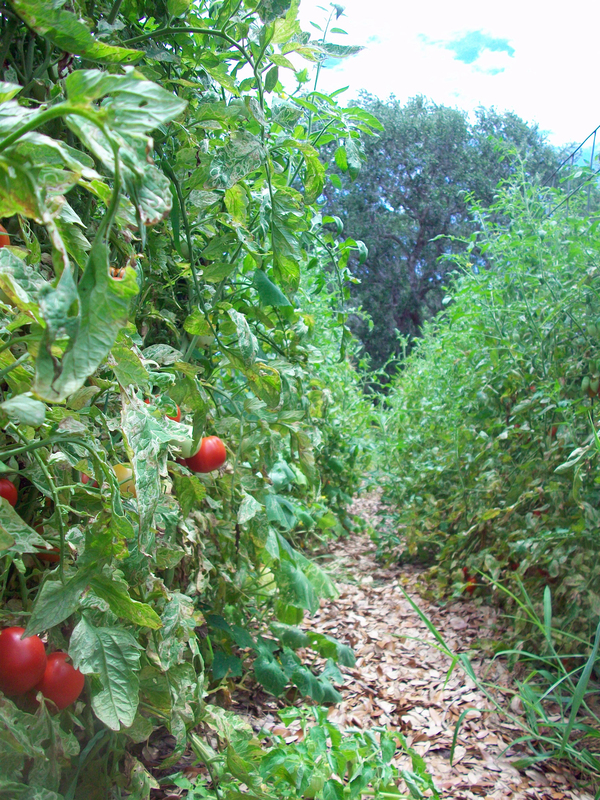 Tomatoes can only set fruit when the nighttime soil temperature is between 55 and 70 degrees. When the nighttime soil temperature rises above 70 degrees, the plant may live, but it will not make tomatoes. That’s why tomato plants often stop producing by July or August. But you can cool your soil and produce tomatoes through the heat of summer with good mulching. Mulch serves as a blanket of insulation over the garden: mulch prevents weeds, stabilizes soil temperature, and helps retain moisture in the soil. Good mulching can dramatically reduce the amount of water required for the garden. Mulch also prevents the soil from drying out in our relentless Gulf winds: 90% of the microbial activity of the soil is found in the top four inches, the layer that dries out the fastest. Mulching protects this delicate layer of topsoil. The best mulch material is always the most native, and the very best mulch of all is raked-up leaves from the trees on your own property. Native leaves have a special relationship with your soil. The leaves and soil have lived together in biological harmony for hundreds or even thousands of years. Their chemistry is highly adapted and they are perfectly matched for growing vegetables. Native leaf mulch is available in vast quantities, usually right in your own yard, and even better, native leaf mulch doesn’t cost anything. Every year, millions of bags of freshly raked-up leaves are sent to landfills and transfer stations; leaves that would have made perfect mulch in backyard gardens. On our farm, we have been using live oak leaf mulch for years. There is a myth that live oak leaves contain an acid that hurts plants, but that is not the case. Our gardens absolutely love their thick live oak leaf mulching. And as the leaves slowly decompose, they add structure to our garden soil and actually improve the soil Ph. We even use oak leaves in our compost piles, and as bedding for our laying hens. The leaves of any native tree will work as mulch: oak tree leaves, pecan tree leaves, and even the duff, or detritus, of mesquite trees make wonderful mulch for gardens. The thickness of mulch applied to the garden depends on the heat; the hotter the weather, the thicker the mulch should be. 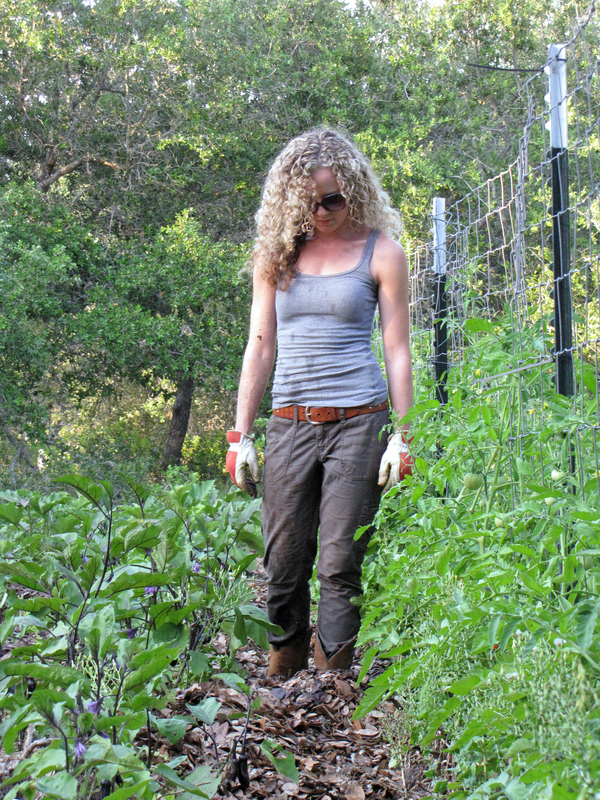 By the month of August, the mulch around our tomatoes is 6 to 8 inches deep. This thick layer of mulch keeps the soil cool at night, and our vines are full of ripe red tomatoes into the hottest part of summer. Thanks for an interesting post! I’ve used leaves occasionally but now i know to put them on much thicker. Do you keep adding them as the plants grow or do you start right away with 6 to 8 inches? Hi Agi! We try to put all the leaf mulch down at once when we plant the transplants. Usually, we companion plant tomatoes into rows covered with mature collards (6 inches off center of each row), and there is already leaf mulch in the rows. So, we just make space between the collards, sweep the mulch out of the way, plant the tomatoes, and then push the mulch back to the base of the tomatoes. If we do not have enough leaf mulch on hand when we plant, we add mulch as it becomes available. Also, when we plant from seeds (any type of plant), we stage the mulch in large trash bags in between the rows until the seeds sprout, and then open the bags and add mulch around the sprouts. When the sprouts grow taller, we add the rest of the mulch, up to 6 to 8 inches. Our goal is to keep the soil covered at all times. Our summers are brutally hot, so we need really thick insulation to keep the soil cool, and to prevent the plants from literally baking in the soil. Thanks Agi! We are wishing you the best! Thank you so much for the valuable information. I’ve got a ton of maple leaves here so I’ll be using them as you suggested. Keep the gardening tips coming! Hi Justin. I found your blog searching for Live Oak leaf mulch. I have a home near the Packery Channel on Padre Island and I need some Live Oak leaf mulch. Do you ever have any extra bags that you would sell? Hello Randall! Thanks so much for your question! We do not typically sell the live oak leaf mulch, and right now we don’t have a surplus. We have a big need for mulch in February and March, when planting our spring and summer gardens. Then we need a lot of leaves again in May, to put a heavy layer down for the summer. For the most part, freshly bagged leaves come available in April, when the trees shed their leaves. On our farm, we take the first harvest of leaves from our own property in Feb/Mar, and put them on our gardens. For the second harvest, we have friends who bag up all their own leaves and leave them sitting by the road. I go around with my trailer and pick up bags until we have enough. 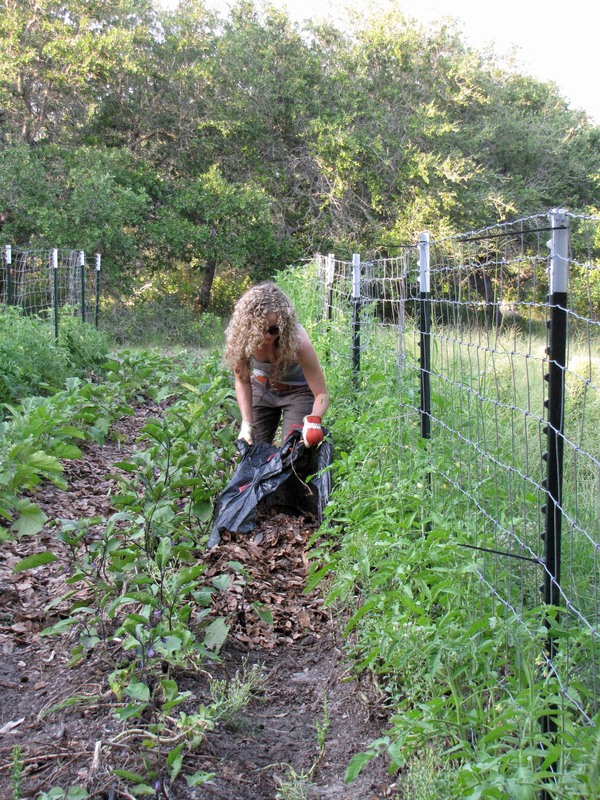 Then I drag the bags into the garden, tear them open, and spread the leaves down the rows. For a small backyard garden, you should be able to easily get enough leaves from a neighbor–someone who will gladly rake and bag them for you, and give them to you for free. This will be cheaper and easier for you than coming all this way to us. Do you want to try this option? If you have trouble finding leaves, let me know, because when the leaves fall, there are plenty of them around! Thanks Randall! Have a wonderful day! So glad to find this article. We have used our pecan tree leaves for many years but I think we’re not using enough. I also wonder about them causing our soil to become too acidic and a friend at work suggested using ashes from our stove for balance. I’m looking forward to trying your ideas for staking them instead of using cages. Hello Melinda! I don’t believe the folklore about leaves causing the soil to become too acidic. 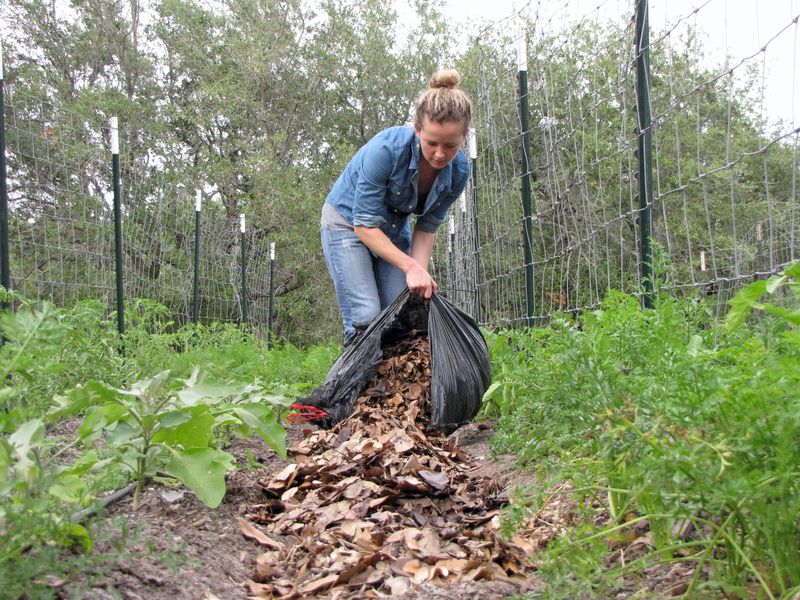 We use live oak leaves in our soil, our compost piles, and as a thick layer of garden mulch. Live oak leaves are considered to be the most acidic of the leaves in South Texas, so if there was a problem with acidity, we would certainly have discovered it by now. We have used a LOT of leaves in our process over the years, and a big part of garden soil by now is made up of broken down oak leaves. The leaves help add a lot of nutrition and structure to our sandy soil, and they become the humus that holds our soil together. We also add a fair amount of wood ash, as well as manure from chickens and pigs, and the greens and roots from our plants, so there is a continual balancing act going on. But, the average gardener in South Texas will never use too many leaves, simply due to the limiting factor of how many leaves you can collect each year from your yard or neighborhood. We send out a call each spring for all the raked up leaves we can get from our community, and we will pick up hundreds of bags of raked-up oak leaves and eventually use them all as mulch or compost. Your pecan leaves are also ideal–whatever is falling from the trees in your neighborhood. Our native trees have a thousand year relationship with our soil, so the leaves and the soil know just what they need from each other. All we need to do is help this process by allowing the leaves to break down into the soil, like they would do on their own if we didn’t get involved! I live in Tucson, which is as hot but drier. The main leaf mulch is from mesquite, which is a great soil enhancer. But I’ve found mulched plants (with a soil that’s always moist) tend to suffer from insect damage compared to non-mulched soil that dries at the surface. I think the decaying plants and moisture must provide ideal breeding grounds for aphids etc. Have you noticed this? Hello Jonathan! I have found exactly the opposite; that dry bare surface soil leads to more pest attacks on plants than well-mulched moist soil. Here is my thinking: The best pesticide of all is healthy soil. Humus-rich, well-mulched, moist soil grows healthy plants, and healthy plants resist insect attacks. The health of the soil is linked to the natural bacteria in the soil, and 90% of the good bacteria plants require live in the top four inches of soil. These bacteria thrive on slightly moist, organic-rich material, and if the top few inches of soil is dry, the bacteria can’t thrive. A thick layer of leaf-mulch over the soil is the perfect environment for healthy bacteria that feed strong plants. But, if the soil stays too moist, it can cause “wet feet” for the plants, which can weaken the plants pretty quickly, and that definitely invites bug attacks. Is it possible the soil is a little too wet where the mulch is? Watering as deeply as possible, as infrequently as possible, is a pretty good rule; and then let the soil mostly, but not completely, dry out before watering again. But in our hot dry weather, that top layer can dry out very fast if not covered with mulch. I can image how it must be to garden in Tucson! I have never seen a garden with dry surface soil outperform a well-mulched garden with slightly moist soil. If pests are attacking a well-mulched garden that is properly watered, I would bet something else is going on there. Maybe too much water, or another factor. You are welcome to post a picture of your soil or plants, to help identify what is going on there. Thanks for the post Justin. I live here in Rockport as well and have seen one of your talks on growing tomatoes a couple of years ago. We are putting in our first garden this spring here in the Rockport sand and wondering what you think of the transfer station mulch to use as a mulching material for the garden? I have used it around my flowering plants and shrubs and they have seemed to do well. I have seen some big piles out at the transfer station with steam literally coming out of the pile, so it seems to be cooking pretty well. Do you ever use it as mulch? Hello Lisa! There are some possible uses for that transfer station mulch on your property, but I would be very careful where and how you use it. We do not use the transfer station mulch in any of gardens for several reasons: First, we don’t what is in it. That material is a collection of whatever people drop off at the transfer station and could be full of who knows what kind of chemicals, not to mention trash or other things you don’t want in your garden. We grow produce for our customers, and we are extremely picky and careful about what goes into our soil. In fact, about 99% of what we put into our gardens we get from our own property, and anything we get from outside our property I know exactly where it came from and what is in it. Second, that material from the transfer station is mulch, not compost–it has large pieces of carbonaceous material that have not yet broken down. A true compost pile is a balance of carbon and nitrogen that has cooked down into soil. That cooking kills a lot of weed seeds, and also creates the most beneficial microorganisms. If you apply transfer station mulch directly to your garden, you will probably get a LOT of weeds seeds that will take years to finally remove. Also, the big chunks will continue to break down in your soil and take much-needed nitrogen from your plants. When you see steam coming out of the transfer station mulch pile, that means it is still heating up, but you DON’T want to use compost that is steaming, because that means it has not cooked down enough. The pile should heat to an internal temperature of about 140 degrees for about three months, then will begin to cool down to 100 degrees or less, which means it is about ready. You know it’s ready when the individual pieces that made up the pile (from branches to fish bones) are no longer identifiable. The compost will smell like wonderful soil from the bottom of a forest. Having said that, the transfer station mulch is a good source of carbon material that is mostly just the clippings of local trees, so not too bad. The only place I would use transfer station mulch is to spread over your lawn in areas where the grass is thin. The mulch will add a little protection and nutrition to the soil. Weeds will quickly pop up, but in that case weeds (pioneer plants that hold together and build the soil) are a good thing. You can just keep mowing the weeds down until the grass comes in. Also, you could use this mulch in your flowers beds, but only after cooking down into something like compost. Simply pile up the mulch, add some good nitrogen material (kitchen scraps), and let the pile cook down. Otherwise, you will get a lot of weeds in your flower bed, and the carbon chunks will steal nitrogen from the flowers. I would not advocate using this material in any beds where you will now or later grow food. People like the transfer station mulch because they see a lot of material that is cheap, and can easily be moved to their property. But there are no shortcuts, at least not without a price. If we could get everyone in our community to stop using chemicals on their property, things would be different. You can easily (and really just as quickly) make your own compost at home using native oak leaves. It is free and sustainable, and it is old-fashioned recycling at its very best. Hi Lisa! We use mostly varities of heirloom corn, such as Cherokee White Eagle, Oaxacan Green, or other Indian corn. If we use hybrid sweet corn, we like Silver Queen the best. There are many great varieties of pole beans. The heirloom we use include: Cherokee Trail of Tears, Mayflower, or many others. For good reliable pole beans, go to Moore than Feed and look Kentucky Wonder Pole beans–these are very good performers. Look for any of their “pole” varieties, there several there, there are all good. I wonder why your friend has trouble with pole beans? When does he plant them? Too late in the season and they may have trouble. Also, if you use a high-nitrogen fertilizer, your beans will not perform well. Finally, if it is a first planting of beans, you may need to inoculate them to get them to fruit. If you don’t inoculate them, the plants will grow and flower, but may not produce a bean. But, any time you plant them there in the future, they will produce fine. I will say, however, that I never inoculated any beans on our place, but got fruit the first time and never had a problem with fruiting on the first time. I have a ton of live oak leaves to deal with every year from the large tree in my front yard. I have started piling them around my bushes, and under the evergreen hedge on the side of the property. However, I have a night blooming jasmine bush by my driveway that didn’t do well with the live oak leaf mulch, and started looking pretty bad. I raked it away, and replaced it with wood bark/leaves from a local tree cutting service, along with a bit of fish emulsion. The bush came back really well, and it looked better than ever. I think that some mulches do better on some plants than others. I know that the “leaf” drop under my Norfolk Pine is extensive, but nothing at all will grow there. Nothing grows under my neighbor’s pine trees, either. I live in St. Petersburg, Florida. I think that one of the best leaf mulches are the same leaves that come from the same kind of trees. That is why I leave the Norfolk Pine droppings alone, and just rake them into a pile under the tree. I know that pine straw is used with tomatoes, as it is said that they like acid soil. Maybe that is why the tomatoes do so well, and some other vegetables. I am not sure. Grass doesn’t like live oak particularly, either, I have found. Maybe some of that is because of the shade. Thanks for your article. Nicely done. Thank you Sieglinde for this wonderful information! I agree with everything! I am curious about that night-blooming jasmine and why the live oak leaf mulch was not good for it. Do you water that jasmine with drip irrigation beneath the mulch, or with the rain function of a garden hose or an aerial water sprayer? One potential drawback of applying a super-thick layer of leaf mulch (or any kind of mulch) is that water applied from the top may not penetrate well down into the soil. We place drip tape irrigation beneath the mulch to make sure the water saturates the soil. Maybe the wood chips allowed more water to flow into the soil, which perked up the plant?